Say the word ‘sustainable’ and prepare to pull out a dictionary as people have varying opinions on what that term actually means. Add farming to the mix and efforts to parse out sustainable farming from unsustainable farming run into a thicket of differing opinions. Yet, there’s one definition of sustainable farming that typically doesn’t make the news headlines, especially those containing the word ‘green:’ A family-run farm that sustains a multi-generational family. Mattson Family Farms is a no-till commercially viable farm that has beaten the odds for a century. “My grandfather immigrated here from Denmark in 1911 to homestead,” says Carl Mattson. The farm is located a little over 100 miles east of the Rocky Mountains on Highway 2 on a plateau about 3,200 feet above sea level. A century later in 2013, ninety percent of the wheat grown on the farm is exported off the West Coast, destined to feed hungry mouths half a world away in Asia. The focus of Mattson Family Farms is on conserving the soil and fertility of the land, and the family has been recognized as leaders in conservation for years. Mattson says the number-one factor that limits production is a scarcity of precipitation. Not tilling the fields is akin to keeping a lid on a jar – the water stays in the soil, protected from the sun’s heat, which causes moisture to evaporate. The family’s no-till farm attracts birds, deer, antelope and the occasional fox, he says. The farming operation is amazingly productive, too. The average annual yield of around 30 bushels an acre translates into the equivalent of six million loaves of bread produced annually on the farm. That’s enough one-pound loaves to give each Montanan six loaves of bread a year, if that grain was not exported. Yet, the bulk of Montana’s wheat is shipped overseas to ports in Asia, where a lot of stomachs need it, he says. Those nutritious grains of wheat contribute to a more peaceful world, he says. Sustainable farming ultimately must support the farmer, too. Even so, it’s difficult to exist on a small farm, albeit possible if you’re growing tomatoes. 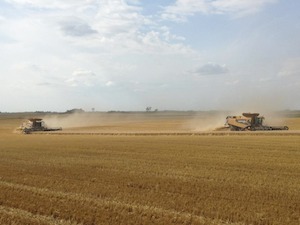 Cultivating enough wheat to sustain a family farm requires vastly more land than a farmer growing tomatoes. That’s why it usually comes down to an economy of scale in order to survive, Mattson says. So, what is sustainable farming? According to Mattson it’s a multi-focus approach with three legs: It supports the farmer, the environment and society. And, there you have the essential kernel of truth on successful wheat farming from a family who’s been at it for a century.